How to manage a trade construction model establishment? As soon as you have a project in the early stage of construction, you can quickly get overloaded with models. Design and construction shop models are coming at you, wondering what graphical data does your project team coordinate against and how is the construction model development and approval managed? There is little on such a process in the public forum and PAS1192-2 and the Penn State BIM Execution Guide are somewhat bare around this area. Below is a proposed theoretical approach, looking at a specific specialist sub-contractor where the Design Intent model is complete before the Construction Shop Modelling has begun. Have a look at it, pull it apart, and comment below on what you believe works and does not work. If it has legs, it shall be integrated into future release 2.0 Open BIM version of the BIMFix Model Establishment Framework. During the construction modeling stage; graphical data will undergo several transitions. The design Intent graphical data may be complete, but changes can still occur, while; the specialist sub-contractor is authoring their Construction Shop Model for approval, and the approved Construction model is undergoing fabrication/construction. Separation into trades: A design intent model (authored by a design consultant), may contain graphical data from several specialist construction trades. For example, the Structural Engineering design intent model may contain the Trades; steelwork, in-situ concrete, and precast concrete. Proposed pre-fabrication and manufacturing graphical data typically goes through a construction modeling process, while in-situ construction graphical data may not, continuing under the design consultant’s governance. To manage each Trade content, the consultant’s design Intent model should be subdivided into design intent trade models, before construction modeling may begin. Duplicate elements: During this transition, a graphical data element could potentially be in two models (i.e. 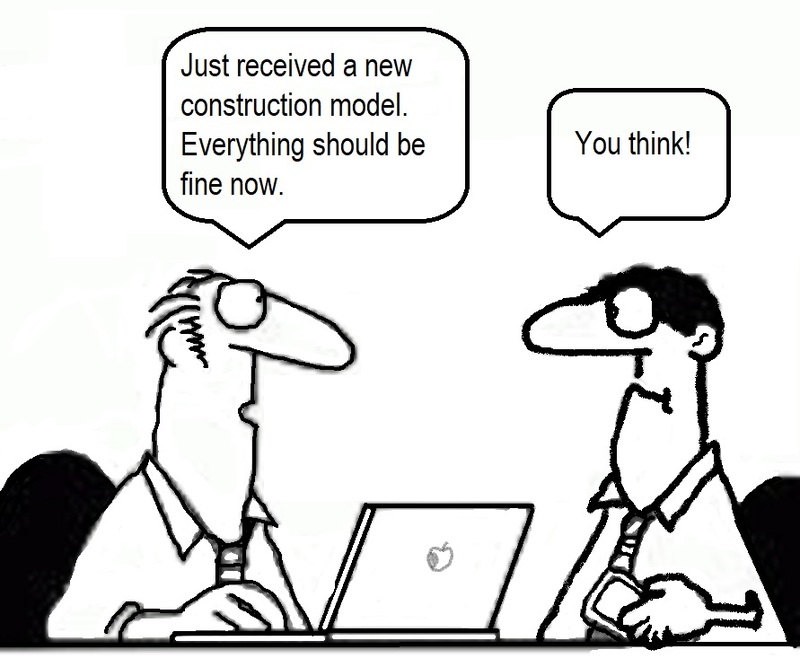 : the design intent model and construction model). This generates a coordination conflict, as the project team does not have a single point of truth for the given element. Thus, a process shall be identified to enable the project team to coordinate with one approved graphical data element. For approval pre-fabrication and manufacturing elements: For approval shop models shall be released to approving project team members only. A separate “For Approval” model shall be engaged. Geometry not yet ready for review, or approved geometry shall not be within the “For Approval” shop model. Fit for construction: Approved Construction model graphical data could be undergoing fabrication, or may have been constructed on site. Due to this different status, they need to be identified separately. As Constructed Elements: BIM projects may have an As-Constructed deliverable. Constructed elements are measured on site, and design/construction graphical data are updated to reflect this within an agreed tolerance. Due to this different suitability (As Construction Record documentation), they shall be identified separately. For this study, I have left out the As-Constructed Process. 1.a: If not partitioned correctly; the design intent model/s are subdivided into distinct Design Intent Trade Models. 1.b: Remaining graphical data (i.e. elements of trade/s not undertaking construction modeling) shall stay under the governance of the Design Consultant during the construction modeling period. As-build or As-constructed modeling is outside of this study of the process. 1.c: Following the project appointment of the specialist sub-contractor (Trade) are appointed, the (complete) frozen Design Intent Trade Models and associated drawings/documents are published to the CDE (Common Data Environment), for the purpose of the Trade/s to begin the generation of their construction models and shop drawings. 2.a: Progressively re-builds a Construction Model from the Design Intent Trade Model (novation agreements may facilitate other construction model generation approaches). 2.b: Construction Model elements/assemblies ready for the approval process, are released exclusively to the “Shop Drawing Review Team”, along with PDF Shop drawings & relevant documents. 3.a: Elements/Assemblies: Fail. – Result: Graphical Data updated by Trade to reflect comments and resubmitted through shop drawing approval process. 3.b: Elements/Assemblies: Pass. – Result: Graphical Data shall be transferred into the Approved Construction Model. 4.a: On receipt of the first Shop Drawing Approval, the Specialist Sub-contractor Trade now becomes the “Curator” of the Design Intent Trade Model for their package. 4.b: The approved Construction Model progressively grows of approved merged shop drawing graphical data. 4.c: The Design Intent Trade Model graphical data which has received shop drawing approval; is trimmed out of the released Design Intent Model by the Curator. 4.d: The approved Construction Model & Trimmed Design Intent Trade Model are updated to the CDE simultaneously. 4.e: Above Construction Model process will repeat as required. At no time shall the aggregate Design Intent Trade Model & Construction Approved Model contain duplicate geometry/elements. 4.f: At the end of the Construction Modelling process, the Design Intent Trade Model will contain no graphical data and shall be obsolete for the purpose of ongoing coordination. 5.a: Following change approval, the new and modified geometry solely of the design change is released, (by the designer) to the Curator. The designer will provide detailed information about the scope of the design change, and ideally the element unique identifiers of the geometry to be removed from the former design intent trade model. 5.b: The Curator, imports design change model geometry into the current Design Intent Trade Model and removes all superseded graphical data. The updated model is released to the CDE for backgrounds and coordination. Design Intent Trade Model Curator (Curator). Removing (hide in export view) graphical data from the design intent trade model which have obtained shop drawing approval. Importing approved design change graphical data, and removing (hide in export view) the superseded graphical data. Re-releasing (That is: exporting the visible graphical data elements in the view,) the updated design intent trade model to the CDE, for coordination and model background purposes only. 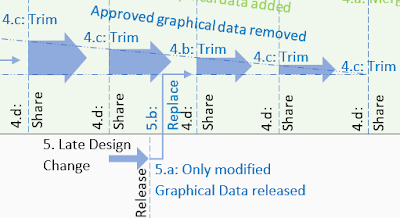 Modifying graphical data beyond hiding it in the export view is prohibited by the Design Intent Trade Model Curator. Thus, the Design Intent Trade Model only contains designer’s graphical data which have not yet been superseded by the shop drawing approval. 1. The design consultant (model Originator) does not know the approval status of shop drawing elements/assemblies, other than their own return review comments. Other reviewing disciplines and the contractor's comments/approvals are often not openly available. Thus, if the Originator was to be the Curator, they would require an instruction from the sub-contractor on which elements/assemblies have received approval. 2. When the design stage is complete, the design consultant only has technical review staff on the project, and not modeling staff (due to fee breakdowns, and work scope), thus making it more difficult to trim the model. This type of task is best carried out by a proficient modeler. 3. The updated design intent trade model needs to be released to the CDE at the same time as the updated Construction model: (to avoid confusion and double modeling). Having two separate parties involved in the release process slows it up, and makes the nonperiodic simultaneous release more challenging to achieve. 4. In existing contracts with design consultants, such a Curator role following design completion is outside their typical scope. Introducing a role into a subcontractor's contract is easily achievable within the procurement timeline. 5. With scripting tools, it is possible for the Sub-contractor shop modeler to link Element Identifiers of the designers model to the Construction model, thus making it a semi-automated process for removing the approved elements from the Design Intent Trade Model. The above process is designed “not” to remove any responsibilities or liabilities. All models and documents authored by the design consultant remain in the CDE, with their status and approvals recorded. The process is ensuring approved information is reaching the relevant project participants at the correct time. The combination of the CDE and how easy it is to engage model comparison tools, remove a lack of trust between the designer and Curator. From model exchange and interoperability, how would this work in the real world? Following a model exchange format agreement, design intent models are exchanged on the CDE in a proprietary file format (e.g. .RVT, .DGN, .DB1), or an Open BIM Format (e.g. .IFC). If the Designer and Curator are engaging the same authoring application, there is no model trimming difficulty. or the Curator also has the Originators software and can export the model to the preferred import format. Both of the above will enable the Curator to trim the Originators model. Open BIM format: If the Curator is importing the IFC file format directly into their authoring application. Due to the challenge of round-tripping errors, it is ill-advised for the Curator to export the trimmed design intent model from their authoring application. Instead; engaging an IFC middleware application (such as SimpleBIM,) would allow trimming of the Design Intent Trade Model with no loss of model fidelity. The industry is starting to understand that when working with IFC files, the use of an IFC middleware is becoming essential, as all BIM Authoring applications have their own quirks in exporting and importing IFC files. Please provide your views below. Have you used or seen a comparable process in the past? If this appears a legitimate approach, the next process development step is projects where the construction modeling is occurring concurrently with the design stage and the As-constructed process. - For Building Lead Consultants using Autodesk® Revit®. BIMFix is pleased to announce this free downloadable framework which can be referenced from or attached to a BIM Execution Plan (BEP). The Framework provides the Project Team clear methodologies on how to establish and share Project BIM (Building Information Modeling) Models, where the lead design consultant is using Autodesk® Revit® as their primary authoring application. The framework is designed to be flexible in meeting project needs, work across BIM/CAD software platforms, and for actions to be controlled and traceable. I will endeavor below to provide an explanation of the components of UK BIM Level 2 which make up is Model Progression Specification. This is a continue of my first article on the subject - UK BIM Level 2 Model Progression Specification – A Review. Text in blue is my additions and comments. The EIR is part of the request for tender documentation setting out the information to be delivered and the standards and processes to be adopted by the supplier as part of the project delivery process. Note 1: An Employer is a person or organisation appointing the Supplier pursuant to the Agreement. Note 2: A Supplier is the provider of services or goods either directly to the Employer or to another Supplier in a supply chain. Note 3: The Employer is not always the Client (i.e. The Client is the individual or organization commissioning a built asset). The Client is the Employer to the Tier 1 Project participants. The Tier 1 Project participants are the employer to their appointed Tier 2 project participants, and this continues down the supply chain. Note 4: Each Tier 1 Supplier, must integrate their BEP (BIM Execution Plan) into the Employer’s Information Requirements (EIR). This BEP gets passed down the supply chain and potentially added to be the subsequent suppliers and subsequent sub-suppliers. Note 5: The above Note 4 strategy, will be repeated with the CIC BIM Protocol contractual amendment. Note 6: The Employer Information Requirements (EIR), is a subsection of the Employer Requirements. Employer Requirements are physical building outcome focused, whereas the EIR is Asset Information outcome focused. Level of Detail identified via a Model Production and Delivery Table (MPDT) – Note should refer to Level of Definition. The EIRs shall be consistent with other appointment and contract documents in use on the project, which in turn should be aligned with industry standards such as the RIBA Plan of Work or APM Project Stages. [Employer] Information requirements shall be specific, measurable, achievable, realistic and time-bound against, for defined project stages and information exchanges. The CIC BIM Protocol (CIC/BIM Pro) is a supplementary legal agreement. It can be incorporated into the professional services agreements and construction contracts by means of a simple amendment. It covers the legal obligations of Employers and Suppliers. An equivalent addendum, of course, can be used. When conflicts arise between agreements, the BIM Protocol is the prevailing reference. When conflicts arise in information the Model is the prevailing reference. The relevant BIM Protocol contents are to be included in all project participant agreements. Until Project close out; [Employer] Information Requirements and the Model Production and Delivery Table are reviewed and updated at each Stage. Ensure an Information Manager Role is Appointed during the entire project period. Produce the identified models to the specified Level of Detail in accordance with the stage data drops in the Model Production and Delivery Table. Note should refer to Level of Definition. Use the Project Team Models in accordance with procedures in the [Employer] Information Requirements. Comply with the [Employer] Information Requirements. Arrange for the BIM Protocol to be included into agreements with any subsequent suppliers. Excludes liability for any corruption etc. of the electronic data which occurs after the transmission of a Model by the Project Team Member, unless caused by a failure to comply with the Protocol. The Project Team Member remains the copyright holder of their Material. The Project Team Member grants non-exclusive licences to the Employer and enables the Employer to sublicense, transmit, copy and use the material with other Project Team Members and Project Sub-Team Members. Licence and Sub-licences for material use may be revoked in the event of Employer non-payments. Licences do not allow modification or amending of Project Team Member’s Material without written consent, or unless the EIR identifies the provision of such amendments, or unless the Project Team Members employment is terminated. Licences exclude reproduction of proprietary work contained in the Material for any extension of the Project. The Employer grants non-exclusive licences to the Project Team Members and enables the Project Team Members to sublicense, transmit, copy and use the material to other Project Team Members and Project Sub-Team Members. The Employer owns any material provided by or on behalf of the employer, Project Team Models, Federated Models, proprietary work contained in the same. Excludes liability for any use of the licenced Material which is not permitted by the relevant licences. This extends to all sub-licenses. Clauses 1 - 7 of Protocol shall continue to apply following termination of the Project Team member’s employment under the Agreement. Note: The above is a summary – Refer to the BIM Protocol for the exact wording and implementation. The BIM Protocol will sit beside the Client’s /Employer’s EIR. It is not uncommon for aspects of the EIR to be placed directly into the BIM Protocol Appendix, or the EIR to be appended to the BIM Protocol itself. The EIR and BIM Protocol establishes the long-term goals of the project and thus are essential information to have at hand in planning the executing of the Model Progression Specification. For the project team members, this will start with the pre-contract BIM execution plan (as part of the return tender submission) and will continue development with a post-contract BIM execution plan. Full title – BS 1192:2007+A2:2016 - Collaborative production of Architectural, Engineering and Construction information – Code of Practice. The document is a British Standard and much of its current content is being considered to be included in ISO 19650:2. It establishes common methodologies for exchanging “containers” on projects that will involve collaborative working. Container: Named persistent set of data within a file system or application data storage hierarchy including, but not limited to, directory, sub-directory, data file, or distinct sub-set of a data file, such as a chapter or section, layers or symbol. The CDE is a managed document repository system which sits on a DMS platform and is provided by the client. It is a single source of information for any given project, used to collect, manage and disseminate all relevant approved project documents for multi-disciplinary teams in a managed process. Below 1192:2007+A2:2016: Table 1 – showing all four sub-repositories in the Common Data Environment. Container Suitability: Identifies how the data may be used along predefined linear process. The below status 1192:2007+A2:2016: “Table 5” identifies the Suitability and Revision progression and what type of data can be used for what. Note the “Status” of an item is the combination of its Suitability and Revision. The below table’s use of heading “Status” is incorrect. It should read Suitability. Project space statement, Identifies strategy of project geospatial Cartesian origin. Quality management, Model Data quality policy and data exchange. The CIC (Construction Industry Council) Scope of Services and the RIBA (Royal Institute of British Architects) Plan of Works 2013, are two similar structured industry frameworks. The RIBA 2013 Plan of Works (first developed in 1963) was an update to be in-line with the CIC Scope of Services. These are process maps for the Project Team Members which define project stages and tasks involved at each stage. They are customizable, adaptable to all procurement approaches and project sizes, improve project workflow efficiencies, are compatible with BIM processes and scope the services provided by each design team members via a responsibility matrix. Above: Simple diagram showing the 8 stages of the RIBA plan of works. Stage 1 to 7 directly correlates to the CIC Scope of Services project stages. Note: The RIBA Plan of works is a free available tool and is often used outside of the UK. Above – Part cut down extract of RIBA Plan of Works identifying the defined stages and suggested key tasks required. The plan of works can be a very powerful tool engaged by the project team facilitating a detail stage breakdown and order of events. This order of events will be crucial in clearly communicating to the project team when design decisions are required and the subsequent coordination. The detailed program plan will inform the models progression. 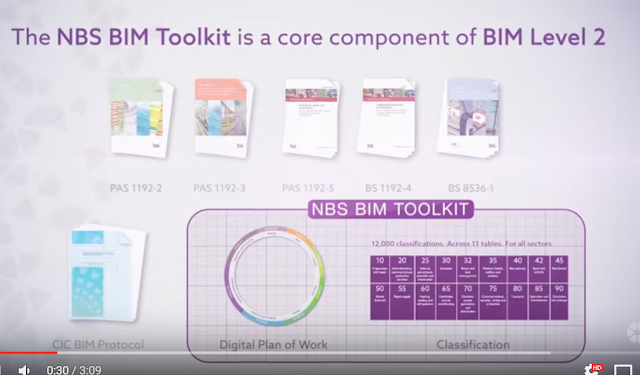 From the website the NBS BIMToolkit is “The free-to-use NBS BIM Toolkit provides step-by-step help to define, manage and validate responsibility for information development and delivery at each stage of the asset lifecycle.” It can be used to assist in the generation of an EIR, Manage Delivery Information and Plan of works. Level of Definition is the collective term used for and including “level of model detail” and the “level of information detail”. Level of Definition are covered in section 9.8 & 9.9 in PAS 1192-2:2013. Level of Definition is, in fact, a very simple approach to a model progression specification. Because each project stage has specific deliverable outcomes (from the CIC or RIBA plan of works), it was expected the model and associated data have reached a minimum level of completeness to communicate this. Within PAS1192:2 the “Model” is the name for all graphical data, non-graphical data, and documents, known collectively as the project information model (PIM). The PIM start with a “Design Intent Model”: and at construction stage progresses to be a “Construction Model”: containing all the objects to be manufactured, installed or constructed. Wording extract from Table 20. The below has been reformatted and sub-numbered to make it easier to read, understand and reference. I (the article writer) found the formatting in Table 20 very challenging to comprehend. · Information only. The graphical model will either not exist or will inherit information from the AIM (for work on existing buildings and structures). What we ideally want here is a building programme of rooms, required areas, relationships, occupancy numbers, essential equipment, heating, cooling, ICT, Security and Electrical outline requirements. i.e. Room data sheets. If the client is expecting a COBie Deliverable, the above data, should be delivered to the design team in a COBie format. It would include the: Facility, Space, Type, Component, Zone and potentially Floor COBie Worksheet, depending on the knowledge at hand. All the units, classifications, and picklists should all be included. Refer to: “COBie Data Drops Structure, uses & examples Drop 1. · Project brief and procurement strategy. · The project needs to be updated: definition of function(s), operation, quality, and time. · Benchmarking updated: capital cost, maintenance cost, time, health & safety, risk procurement contract. · Performance requirements: Priorities and aspirations for function, mix of uses, scale, location, quality, performance in use, cost (Capex & Opex), value, time, health & safety, embodied and in use carbon, energy and resource needs, standard designs. · Site constraints: geo-spatial, available site information. · Initial project budget Order of Cost Estimate. · Client requirements, E.g. to avoid impact on other operations. · Management systems for information and decision making. There is no mention of commissioning an existing conditions survey which can have a turnaround of 6 to 8 weeks. A Survey will be required before Stage 2 commencement. · The graphical design may only show a massing diagram or specify a symbol in 2D to represent a generic element. · Models which communicate the initial response to the brief, aesthetic intent and outline performance requirements. · The model can be used for early design development, analysis, and coordination. · Model content is not fixed and may be subject to further design development. · The model can be used for coordination, sequencing, and estimating purposes. · Refined project brief and concept approval. o Services philosophy and special arrangements. · Preliminary assessment of energy use and embodied/ in-use carbon, incorporation of standard systems. · Environmental control philosophy and special allocations for ventilation. · Availability of the site and outline construction methodology assumptions. · Services capacity for the site permitted working hours on site. · Crane use zones, If the contractor is not engaged at stage 2, I don’t know how these are delivered. · Feasibility whole life cost plan. · Potential delivery and lay down zones. · NRM3 (New Rules of Measurement) maintenance cost plan. · At design stage, the objects shall be represented in 3D with the specification attached. – What exactly specification attached means needs further clarification. · Design development and early contractor engagement. · The model can be used for coordination, sequencing and estimating purposes including the agreement of a first stage target price. · Approval of co-ordinated developed design. · Generic systems, objects, or assemblies represented with, detailed form, function, cost. · Defining all components in terms of overall size, typical detail, performance and outline specification. · Primary geometry is frozen. – This important clause requires further clarity. · Integration of standard designs and systems. · Builder’s work strategy for significant interfaces. · Energy use embodied and in use carbon. · Detailed design and construction. · Assumed procurement package performance and spatial boundaries. · Other relationships between procurement packages. · Assumed design codes regarding dimensional tolerances of related systems. · Foundation tolerances for the use of off-site modular systems. · Assessment of predicted movements (thermal, loading, creep, shrinkage etc.). · Confirmed crane (or other lifting system) zones. · Formwork details. It’s unclear what this requirement means at this early stage. Planning of enabling works, temporary buildings, and hoardings, would appear more appropriate at this design stage. · Contractor’s first stage bid submission. I’m assuming the contractor will take 4 weeks to generate a return bid, which would be followed by 2 weeks of negotiations. So we are halfway through Stage 4 when a fixed price is established. · Detailed whole life cost plan. · A feasible logistics sequence for the construction sequence. · Confirmed modular strategy (volumetric, panelized, hybrid or other). · Provides the basis for Integrated: Production Information to be produced on a package basis with limited risk of changes to primary coordination. · NRM2 and NRM3 cost plans. · Health and safety risk management. · The level of detail should as a minimum represent the space allocation for the product’s access space for maintenance, installation and replacement space in addition to its operational space. For example, the space required to turn on or turn off valves. · The object shall be based on a generic representation of the element. · A dimensionally correct and coordinated model that can be used to verify compliance with regulatory requirements. · The model can be used as the start point for the incorporation of specialist contractor design models and can include Information that can be used for fabrication, co-ordination, sequencing and estimating purposes, including the agreement of a target price/ guaranteed maximum price. · Specific systems, objects and assemblies accurate in terms of specification, size, form, function and location. · Critical interfaces flagged. Other than a traditional written report, I’m unclear how this is achieved. · Confirmed clash free detailed production programme sequence. · Updated: energy use and embodied and in use carbon, detailed design and construction programme. · Allocated procurement package relationships, performance, and special boundaries. · Actual dimensional interface requirements. · Records of any derogations approved. · Actual on-site to off-site interface specifications. · Construction methodology, sequence and movements, critical to how the production design is developed. · Contract Sum/ Target Price/ Agreed Maximum Price. · Pre-construction whole life cost plan. · Details of the actual off-site system to be used. · Critical lead times confirmed. · Off-site manufacturing capacity reserved. It’s unclear how this occurs if the Sub-contractors are not engaged before this stage. This assumption is the primary sub-contractors are engaged at the start of stage 4. · The specification properties and attributes from design allow selection of a manufacturer’s product unless the product is nominated, free issue or already selected. · The generic object shall be replaced with the object procured from the manufacturer. Any essential information to be retained shall be reattached or relinked to the replacement object. Difficult to achieve without an external linked Database. · An accurate model of the asset before and during construction incorporating coordinated specialist subcontract design models and associated model attributes. · The model can be used for sequencing of installation and capture of as-installed information. · Complete fabrication and manufacturing details. · System and element verification. · Operation and maintenance information. · Modify to represent as installed model with all associated data references. · Specific systems, objects and assemblies accurate in terms of specification, size, form, function and location with detailing, fabrication, assembly, and installation information. · Detailed routing of systems. · Fixings and interfaces details to be used. · Updated: energy use and embodied and in use carbon. · Detailed design and construction programme. · Progressive capture of actual dimensional data for critical interface dimensions. · Progressive capture of information for calculating material requirements for follow-on packages. · Capture of object status for progress reporting and collaborative planning. · Construction methodology, sequence and movements, critical to installation. · Formwork details including install and removal sequence. · Actual traffic diversion details. · Contract Sum/ Target Price/ Agreed. · Object status progress recording to initiate demand pull signals for deliveries. · Recording status of security critical areas (EG unchecked, sweep in progress, screened and secured). · Updated health and safety risk management plan. · NRM3 maintenance cost plan. · The selection of the product should give further detail about flanges and connections so that final positioning of pipework and ductwork can be defined. · Although minimum levels of graphical detail can be specified at each design stage, care should be taken that adequate detail is provided to convey design intent and installation requirements. See Design Framework for Building Services, Churcher, 2012. · Clash avoidance/checking shall continue during the construction process as the models are updated with as-constructed information and checked against the construction tolerances specified in the contract. · Construction or manufacturing defects or deviation out of tolerance shall be measured and the models updated within a time agreed across the project (e.g. 24 or 48 hours) so that impact on following trades can be checked and appropriate decisions can be taken. · All necessary information about the product shall be included in the handover document and attached to the commissioning and handover documentation. · The as-constructed model shall represent the as-constructed project in content and dimensional accuracy. · All the manufacturer’s maintenance and operation documentation, commissioning records, health and safety requirements, the final COBie information exchange, as-built models in native format and all relevant documentation. · An accurate record of the asset as a constructed at handover, including all information required for operation and maintenance. · As constructed systems, operation and maintenance information. · Agreed Final Account Building Log Book Information gathered as key elements are completed to feed installation information for the later packages. · Updated: Geometry and installed product information, “as constructed” Accuracy/ resolution of information. · Commissioned performance for: Opex, energy, and carbon. · Snagging (defects/punch-list) actions status. · As constructed 3D scan. · Element performance test results. · Confirmed status that the construction aids have been removed. · Remote monitoring systems status. · Potentially using model information for lines of sight from cameras, Should this not be done during design. · PAVA (Public Address and Voice Alarm System) zone controls, etc. · Handover and maintenance programme. · The performance of the project shall be verified against the EIR and the brief. If the specification is not met and changes are necessary, then objects that have been changed or replaced with different equipment shall be updated accordingly. · At the in-use stage, the object’s information shall be updated with any supplementary information such as maintenance records or replacement dates, and objects that have been changed or replaced with different equipment shall be updated accordingly. · An updated record of the asset at a fixed point in time incorporating any major changes made since handover, including performance and condition data and all information required for operation and maintenance. The full content will be available in PAS 1192-3:2014. · In use performance compared against Project Brief. · Revisions for modifications to the facility during its life. · As modified survey data. · The design of any construction requirements, EG: temporary safety supports or restraint systems if structural defects have been discovered. · Asset replacement sinking fund. · Facilities Management systems running on model-generated information. · Geometry for letting activities accessed from “as constructed” model. I hope the above can be a discussion starter. If any of the above information is factually incorrect, please advise point out the error and the relevant document clause reference, and it will be correct. Below references are for part 1 & 2 of the article series. BS 1192:2007+A2:2016 - Collaborative production of architectural, engineering and construction information. Code of practice. Building Information Management - A Standard Framework and Guide to BS 1192 – 2010 - Mervyn Richards. PAS 1192-2:2013 Specification for information management for the capital/delivery phase of construction projects using building information modelling.